I consume a lot of RSS feeds. That is where I find nearly 100% of the links for my Today’s Readings posts. But suddenly my world turned upside-down, so I’m documenting the problems (and hopefully the solutions) for anyone else that experiences the same. I use Feedly as my RSS feed engine, after migrating from Google Reader. In fact, I’ve been using Feedly since before the Google Reader shut-down. I consume content nearly 100% using an HTC Desire S, which runs on Android 2.3.5. That’s an old OS, I know, but it’s a refurbished work phone, and it cannot be upgraded. I frequently try using the Feedly app for Android, but always find it to be buggy (at least on my old phone): as I swipe from post-to-post, eventually one post will get “stuck”, and will appear over and over, randomly interspersed between actual posts. But if I jump back to the list view, I can see the actual posts that are in my feed, not the “stuck” post that was displayed to me while swiping. I have restarted the phone, but this hasn’t fixed the issue. So I went to the gReader website to tell them, but as I started filling out their contact form, I realized I needed to be able to describe things better than a <textarea> was going to allow me to do… They also offer a forum link, but it’s basically the same thing: limited. So while I planned on finding a better way to contact them, I wanted to get on with reading. Feedly website login error message: This tab should close automatically. If not, please contact care@feedly.com for support. Well okay, at least I can contact them via email! Once again, I am not writing this just to rant and rip gReader/Feedly a new one, but simply to document the trials and tribulations of one of their consumers, with the hopes that thorough documentation of the problems can help solve them. And I hope they do, soon. So I will publish this post, then send the link to the above contact email, as well as post to the Feedly Google Community and gReader Google Group. I will update this post with any updates I receive. 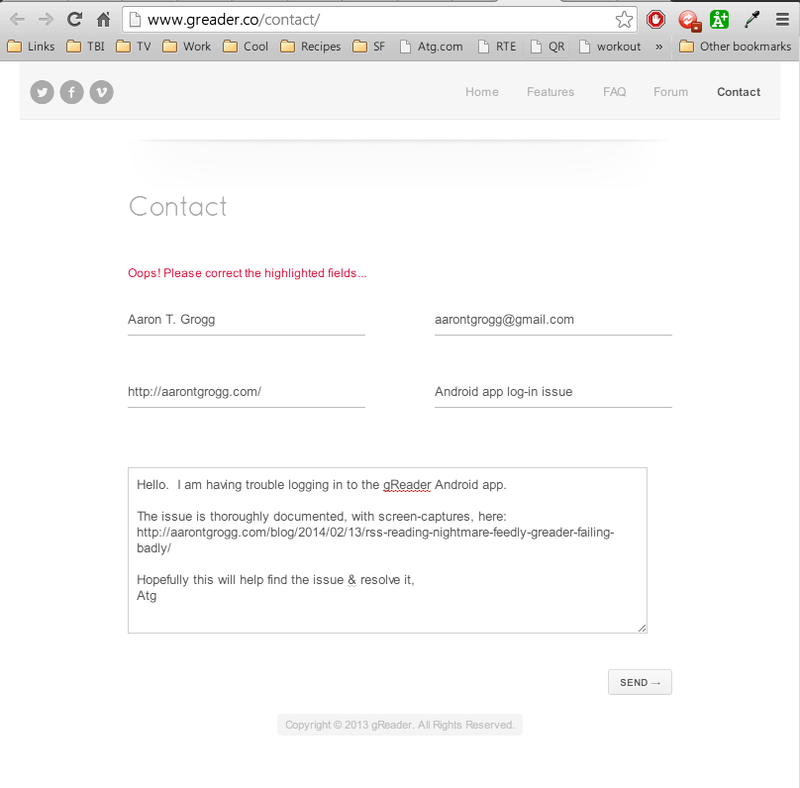 This entry was posted in android, rant, responsive web, rss. Bookmark the permalink. Reader @trodrigues offers hope via Twitter! I had not, but by the time I picked up my phone, it had, and gReader now logs-in just fine! One down! Thanks, Noin Noin!! I read a ton of RSS feeds to compile a list similar to yours. I have to say, I never liked Feedly one bit. Perhaps its just a personal preference thing but I ended up paying for Newsblur and I really can’t say I have had much if any complaints since doing so. Im having an issue with feedly regarding it out-of-charts data usage (250mb in 10 min), and since i have a limited data plan i cant use it while commuting. Regarding the inavility to use your phone outside your country/provider, i had the same issue (entel Chile), but i paid around 60 dollars and got it unlocked. Not trying to promote a specific site (i’ve seen a lot of alternatives) but i used a site called doctorsim (i think its .com) and it worked, now im usig a german sim card.